Bursting with life, form, and color, America Martin’s compositions pioneer a reaffirmation of life and the human experience. JoAnne Artman Gallery is pleased to present, America to Me, an exhibition featuring both new and retrospective work rooted in Martin’s investigation of the human form and its context. Replete with biographical anecdotes and self-reflections, Martin integrates her strong personality and story telling as she cogitates upon the opportunities and challenges that America, the country, has afforded America, the artist. Sparking conversations about what has and has not succeeded in both her personal experience and in the quest for freedom and eradication of bias, each work is created both to question and to express gratitude. Remaining true to her heritage and integrity as an artist, this retrospective serves as a nostalgic memoir infused with tales of opportunity and Martin’s raw talent. Adhering to her signature style, Martin seamlessly introduces allegory through radical forms and an unmistakable aesthetic sensibility. Strikingly bold in composition and narrative, Martin’s works investigate the framework of humanity as she continues the ubiquitous theme of identity. Offering a hopeful look towards a future of inclusivity and acceptance, Martin’s artwork alludes to the America we hope to be. 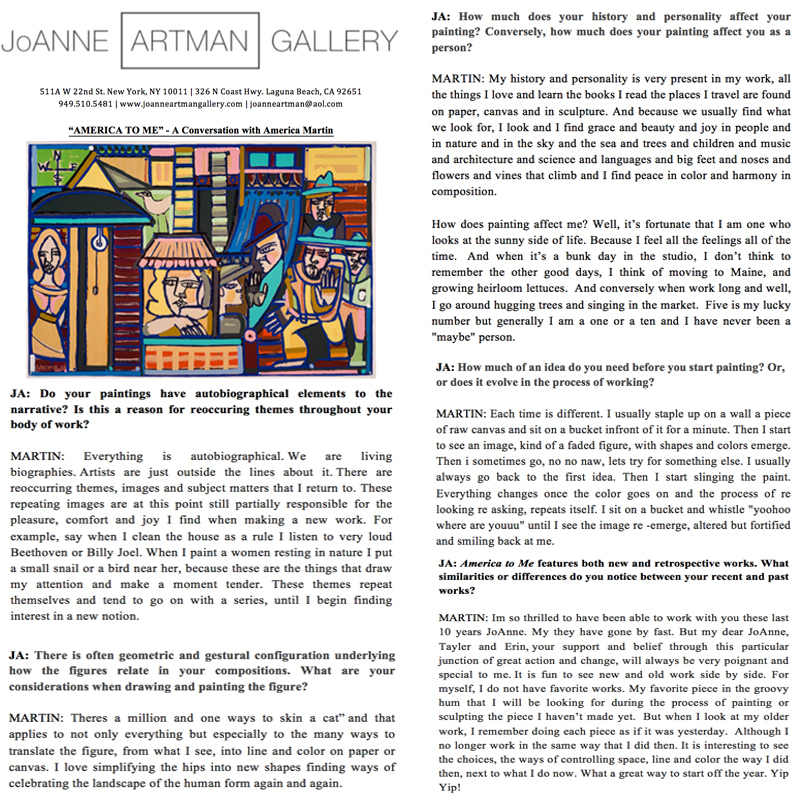 America Martin’s work will inspire, provoke, engage and mesmerize. With visual perceptions always changing, peek behind the stories told and you're sure to find the right artistic expression.